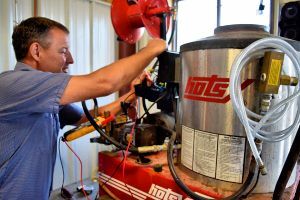 Washer Systems of Iowa has a full service shop equipped to provide a professional estimate and experienced repair for your pressure washer, waste oil heater, or floor care equipment. We repair and maintain all makes and models of equipment we sell as well as providing repair services for other commercial brands. 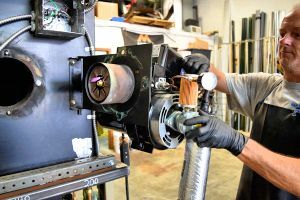 With over 27 years in the industry, no one has the experience and expertise we have when it comes to repair and service of pressure washers, waste oil heaters, or floor care equipment. Our repair and service technicians can often times troubleshoot your equipment problems over the phone, but when it is critical to your operation, we can provide on-site repair anywhere in Iowa, northern Missouri, and eastern Nebraska. 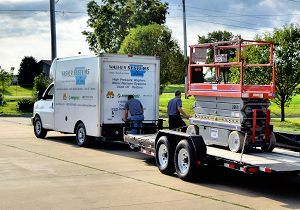 We have three fully equipped, stocked, and enclosed service vans with highly skilled technicians ready to get your operation back up and running quickly. A number of our clients are in the ag and trucking industries and have biosecurity concerns when it comes to onsite service and repairs of equipment. Washer Systems of Iowa is fully committed to preventing the spread of contaminants and pathogens by working closely with our clients. If your facility or operation has biosecurity concerns, contact us and we can implement steps to ensure proper hazard cotrols are in place and followed. We have been serving our ag and trucking clients for years with an excellent safety record. If your equipment is broke down again, stop seeing red and contact our skilled technicians for quick and expert repair. You can schedule or request service any time by filliing out and submitting the form on the right. Our expert staff will contact you within 24 hours.